Self-confessed adrenaline junkie Grant Logan’s life was changed completely in September 2003 when he broke his spine in a motorbike accident. His drive to live as fully and independently as possible led him to starting Disability Today, a website that provides a range of news relevant to people with disabilities. After an initial meeting to get help with informatics, Grant found that London South Bank University (LSBU) could help get his social enterprise off the ground in even more ways than he’d expected. 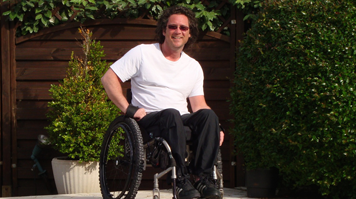 Despite starting the world’s first social network for wheelchair users called the Wheel Life, Grant realised that none of the social networks, including his own, were satisfying their users or were as inclusive as they could be. “So many times I had come back from being involved in events to hear the words ‘I wish I’d known about that’ from other disabled people. This got me thinking that often the biggest problem can be getting the information out to the intended person. So after some thought I decided to build a news website and help push the information out to the community that so need it most,” he explains. The idea for Disability Today was born, a one-stop (online) shop for disabled people where they can read highly relevant news, find out about and access vital services, and meet others with the same disability. Grant was initially interested in accessing LSBU’s Informatics expertise to help scale up the website and reach people with a wider range of disabilities. He was introduced to Dr Safia Barikzai, an Academic from the School of Engineering, but it quickly became obvious that Grant would also benefit from business support and mentoring. Neil Pearce, now Head of Knowledge Exchange for Research, Enterprise and Innovation, was invited to meet with Grant and they hit it off straight away. Although it isn’t strictly part of his ‘day job’, Neil agreed to support Grant, acting as a mentor and offering business advice. “It’s your civic duty giving back. If you’re not a profit generating company, where else would you go?” says Neil. Thanks to a new LSBU winter intern initiative supported by £100K funding, Neil was able to match Grant with Jeevithan Jeganathan, a BSc (Hons) Business Information Technology graduate. Jeevithan is profoundly deaf and was able to bring his own experience of disability to the project. As well as contributing her extensive expertise, Dr Barikzai also oversaw the project and supervised LSBU’s biggest contribution, which was designing the new website so that it met international standards for web accessibility. The newly designed website was ready to launch after just six weeks. The relationship between Grant and LSBU continues to grow. Over the 2015 Summer, a second intern will be helping Grant to implement further upgrades to the site, which will be re-launched in the next few months. Second year Marketing students will also help develop an integrated marketing and communications plan with the aim of increasing the site’s engagement with existing networks.